My 1948 Massey-Harris tractor resides in a garage with a nearly spotless Triumph Bonneville and a very clean ‘74 Porsche. The tractor’s patina shows the honesty of decades of continuous use. The once vibrant red paint has faded to a burgundy in spots and there are other areas where there is a rich dark brown or black. The yellow wheels have turned light brown. The engine coated in a thick layer of oil and dirt. The tires are stress-cracked yet still holding air just fine. Mechanically, the machine is strong, aside from some small issues. Often the question is posed to me, “will ya restore it?” and I always answer quite confidently with no. In the automotive world, there is an ever increasing interest in leaving antique and classic vehicles in original, unrestored condition. Even in cases where there may be obvious signs of wear and tear or general deterioration, the thought is, ‘well, it’s only original once.” This is true, though sometimes it must be said that this ethos goes a bit too far. Finding a ’32 Murphy-bodied Duesenburg in a back alley garage is indeed a very exciting thing. But upon discovery, the tendency now is to dump some fresh gas in it, throw a jumper on the battery, and see if it’ll turn over and run without immediately catching fire. If it’s a success, then by all means, leave it filthy and rotting. After all, the deteriorated stitching on those leather seats will never be ‘original’ again. The seamstress who sewed it has been dead for 50 years and nobody can possibly replicate her work exactly. At some point in the near future – before the collector car bubble finally does burst…again – it would not be surprising to see a team of Bonham’s employees with white gloves pushing a dusty, flat-tired time capsule on stage in front of wine-sipping millionaires while the auctioneer boasts that this particular example was once owned by Clark Gable’s mistress and the same colony of mold has been growing in it since 1957. Such provenance! As for my Massey-Harris, well that’s not really the case. The originality is a great thing about it, yes. But also, it’s a tractor. Not a Duesenburg. I chose to keep it original because it was never meant to stay stay vibrantly red. It has absolutely nothing to hide. There are no specially reconstructed body panels that were formed over an ash frame by the one person in the world who still knows where the trees grew that the lumber was sourced from in 1931. 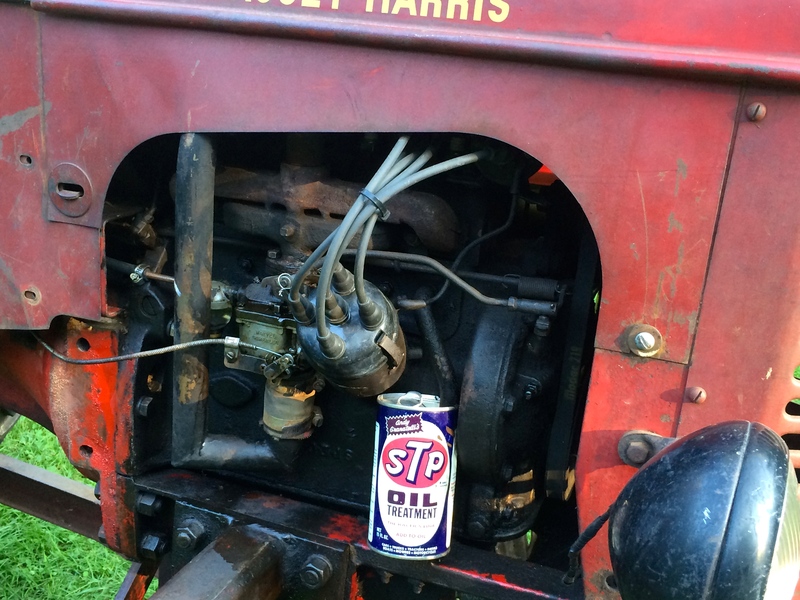 That being said, I like to keep anything I do to the tractor as period-correct as possible. Some of the wiring looms have sagged in places that I’d rather they didn’t, for example. To remedy this, some might choose to use a plastic zip tie. However, I prefer good-old mechanic’s wire. Same goes for the small retaining clip that simply flaked off the rod from the governor. It’s not original specification, no. But it is a perfectly functional back-yard repair keeping with the period of the vehicle. You can imagine a farmer – or my grandfather for that matter – in the 1950s running into a similar problem and just grabbing some wire from the old work shed. One day I decided that the novelty has worn off of the copious amounts of oil residue that blow out of the breather tube as the engine runs. Not that it really bothers me from an environmental standpoint at all, but I would prefer no further buildup of goo on the engine block. Now in this situation, a modern breather filter element simply will not do. It would be utterly out of place. In the old days, the usual solution was an old tin can with a hole punched in the top stuck under the tube. If it wouldn’t stay in place, well, use wire. I have an assortment of vintage cans around the garage. Some I prefer to keep in good condition for decorative and nostalgic purposes. However, I had an unopened yet slightly scratched and dented 15 fluid ounce can of STP Oil Treatment dating from somewhere around the Johnson administration. This would be perfect. I’d been curious for some time what the substance inside now looked like after 50 years of aging, still sealed in it’s original packaging. 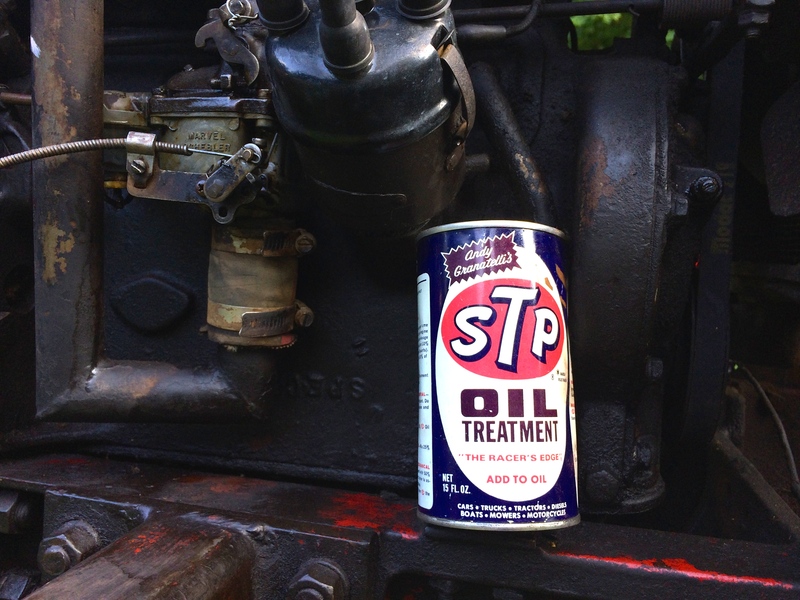 I took the STP can to my toolbox and studied it as if it were some sort of prehistoric artifact from the glory days of internal combustion. If I opened it, would the soul of Andy Granatelli violently pour out and encircle my garage? Would all the power-robbing impurities and harmful deposits in my life be divinely removed? There was only one way to find out. I carefully took a metal punch and aligned it along the edge of the can’s lid. I didn’t want to use the pull tab since I wanted most of the top to remain attached. After I felt satisfied with the location, I pulled out a hammer and gave the punch a good smack. I removed the tool to find it coated in a somewhat thick yet still very viscous substance. I drained it to examine the mysterious contents. Perhaps Andy was still inside. It poured out light brown in color. This consistency was somewhere between K-Y Jelly and Vaseline. Mostly odorless, slightly sticky. Fascinating. I slotted the breather tube into the vintage can. It stayed in place well – no wire needed. Now with my extraneous-hydrocarbon-collection-canister in place, I went through the process of starting the tractor’s engine. Anymore, it’s just easier to crank it over by hand – something of a lost art these days. The starter and ring-gear on the flywheel are reluctant to engage most of the time. I can still recall my grandfather bravely reaching in front of the engine to grab the fan and slightly rotate things a bit so that the electric starter might find more purchase. That’s one way of doing it, but it’s fraught with potential danger. Granted, many things about this machine can be quite dangerous. After all, I did nearly lose two fingers to that very fan blade not all that long ago, but that’s another story. First, you must turn the key on. Alas, the key has been kicked out of the switch numerous times thanks to it’s awkward location. Sometimes jamming a screwdriver into the slot works, or even the broken off piece of old key. Once the power is on (that’s 6-volt positive ground power, by the way) the amp meter will jump a tad. Then, the throttle can be pulled on a click or two. The choke isn’t usually necessary unless it’s rather cold. Grasping a downright Victorian looking piece of bent iron rod, I walk to the front of the tractor and insert the device through slot in the grille and eventually into the one-way cog in the crankshaft pulley. This is the exciting part. Will it kick back and snap your wrists? Have to make sure it’s in neutral by the way. I stand to the left and grab the crank with both hands. With two brisk pulls the old flathead four purrs to life as a faint haze of blue exhaust rises towards the clouds. The sounds of vintage agriculture fill the air as I set off into the yard. A slight ticking of the valves emits from the otherwise happily humming Continental N62. The purposeful mechanical whine of straight-cut transmission gears and drive reductions. The occasional metallic squeak and rattle of implement attachments secured by cotter pins. This sort of machinery is truly beautiful in it’s antiquated simplicity. A bit dangerous, lacking in any sort of refinement, but by God, it’s built darn good. My canister functions well it seems. The oil residue collects inside and the fumes merely dissipate naturally into our ever more fragile ozone layer. This simple device would clearly not do as part of a proper restoration. It’s not exactly original as the tractor left it’s factory in Toronto in 1948. However, it works and it looks the part. Now, should I scrape off the six decades worth of old oil residue caked to the engine block from before? No. I’ll leave it. It’s not Clark Gable’s mistress’s Duesenburg, but it is my grandfather’s tractor, and he really worked to get that patina on there. since air can also flows into the motor thru the breather tube it might be a good idea to put a filter of some kind on it. Interesting story and I couldn’t agree more with your philosophy. Well done.